Conference issue (14th Ibn Sina Arab Conference on Heterocyclic Chemistry and its Applications (ISACHC 2018), 30 March-2 April 2018, Hurgada, Egypt). 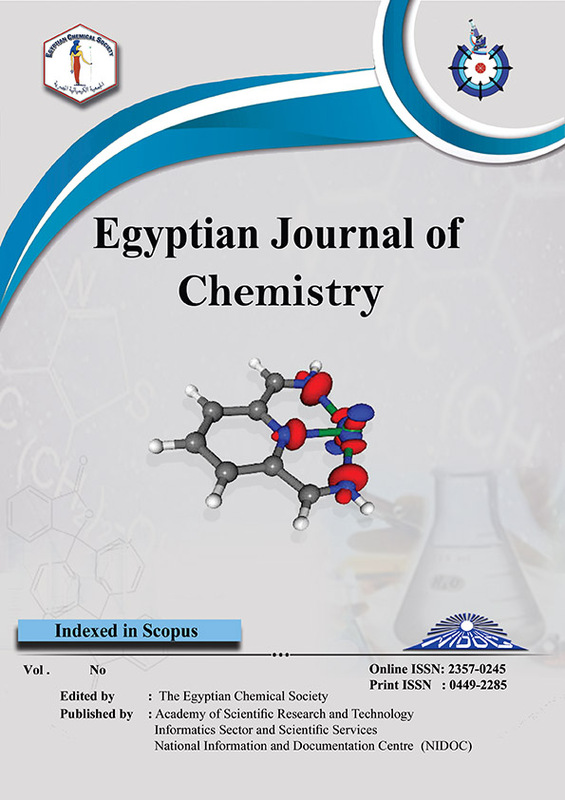 The removal of Fe (III) from aqueous solution using thiosalcylic acid (TSA) as adsorbent have been demonstrated in this work. TSA was Characterized by SEM, EDX, FTIR and XRD. Various factors affecting on the removal include the contact time, initial concentration of ions, adsorbent dose, initial pH and temperature have been studied. The experimental data showed that, the removal percent of Fe (III) ion is increased by increasing contact time, adsorbent dose and pH values. The sorption reaction was found to obey a pseudo second-order rate model with qe = 275.78 mg g-1. The sorption isotherms data fit Langmuir and Freundlich models. The waste solid from the adsorption process (thiosalcylic acid adsorbed Fe (TSA-Fe)) successful in removal of methylene blue (MB) and crystal violet (CV) dyes from binary system.